We arrived at the car park that we normally use as were about to start our working day. They operate a simple system whereby you buy a parking ‘pass’ for the year and even though they don’t operate a dedicated reserved parking space you park in whatever spaces are free. It also operates as a public car park whereby people can park and pay. From a business point of view it doesn’t sound ideal as you might worry that you won’t get a parking space when you need it (such as in the lead up to Christmas) but this is never an issue. When you arrive early for work there is an extra bonus because at that time you can get a parking space on the lower floors. This Monday we arrived early to find four of the very best parking spots empty but marked up with very clear signage “VIP – Reserved“. Obviously, the car park has done a deal with some new customers but instead of offering them the package that they were operating with everyone else they offered a new package whereby someone could reserve their own space. Let’s assume for a moment that the new customers have agreed to pay super premium for these reserved spaces in prime location – fair enough. First as an existing customer for the last two years (we pay for 3 spaces) I would have liked to have been offered this package that was not available before – this was a lack of courtesy. 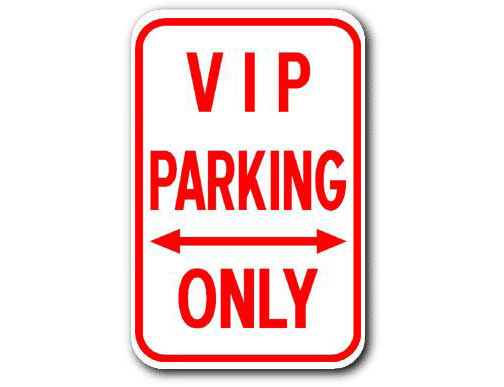 Secondly if you do operate reserved places please don’t call them “VIP” as this makes the rest of us existing customers (99%) feeling not quite so important. “Reserved” is enough. If you introduce any mechanism for categorising new customers be careful how you make the existing ones feel. This entry was posted on April 26, 2017 at 12:08 pm and is filed under Brand Loyalty, Branding, Communications, Customer Care. You can follow any responses to this entry through the RSS 2.0 feed. You can leave a response, or trackback from your own site.